So it’s Saturday morning and Kes comes in and drags me out of bed to go do a little shopping with her. So I hop up and while she gets dressed I am in a little quandary since I can’t find anything to wear that fits. You see, I’ve lost weight. A good deal of it, as a matter of fact. So have Kessa and Keelan. We’ve all been on the diet train. I put on a sleeveless white blouse and walked into the living room and stepped into the stairwell. I immediately reply that there may or may not be an occasion during our shopping trip where the need to do The Funky Chicken occurs. Kes’s head snapped around like a homing device and her eyes zeroed in on me. At some point in the day, on the way to the car, I had a pair of reading glasses perched on top of my head, (I mean how else am I going to read price tags? ), and I was taking a pair of sunglasses out of my purse to apply to my eyeballs, having completely forgotten the reading glasses up there. Kessa pipes up, “Mom, you’ve got too many pairs of glasses on at one time… one’s the limit. I told her that I always wear two pairs when I’m going to do The Funky Chicken and she came to a complete stop in the parking lot. I think this leaves the chance open for another day and if I keep my mouth shut and don’t remind her that it’s even a possibility… Well, I could very well be seen doing The Funky Chicken in the parking lot of Target near you. Or maybe even far away. The priceless thing won’t be me doing it, but the look on the young lady’s face with me. I’ve yet to need to pull out the emergency Funky Chicken. 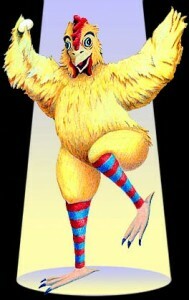 So now I know why my weight lass regime is going so slow….I need to start doing the Funky Chicken in the mall. I had to laugh because I usually have two pair of glasses on my face/head when shopping too. When I forget my reading glasses I have to wear my sunglasses while I shop because they are prescription. I hate doing that because I think the security people think I’m gonna rob the store. I wish I could do the Funky Chicken with my newly smaller arms! LMAO – Pleeze PLEEZE video the funky chicken! THat would be awesome! Thank you for a new way to humiliate my children in public. I love you for it. I’m almost tempted to go adopt a teenager just because I’m too impatient to grow my own and wait over a decade before I can know the joy of threatening him or her with doing the funky chicken in public. Dang. I finally come back to my blog and now you’re on extended absence, it would appear. Miss ya, hon! Daddy did a damn smart Funky Chicken. I’m sure yours will dazzle. If the apples don’t fall far from the tree. This is cute where did you come up with it? God bless you. Hello, I enjoү reading all of youг article.